What do you get when you combine the Moon, a recently rediscovered forty-year-old Soviet probe, and a laser? The most accurate lunar measurements ever made - and, just for the hell of it, a way to prove Einstein right...or wrong. Although it got a bit lost in the hoopla of the greatest achievement in the history of human exploration - Apollo 11 to its friends - the Lunokhod 1 probe was one of the greatest successes of the Soviet space program. 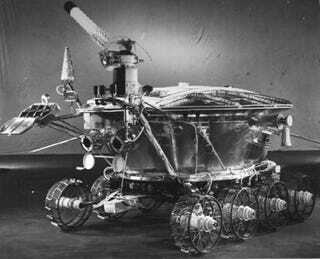 Carried to the Moon by the Luna 17 rocket in 1970, Lunokhod 1 (which means "Moonwalker") was the first remote-controlled robot put on the surface of another celestial body. The rover traveled seven miles across the lunar surface during its eleven months of operation, sending back tons of TV images and high-resolution pictures during its tour. When contact with Lunokhod 1 was lost, so was its location, and it remained missing for forty years until NASA's Lunar Reconnaissance Orbiter happened to spot it in one of its images of the lunar surface. This opened up the possibility of reestablishing contact with the old rover using the laser retroreflector placed on Lunokhod 1. Astronomer Tom Murphy of the University of California San Diego used the telescope at the Apache Point Observatory in New Mexico to send laser light pulses to the rover's lunar coordinates. They instantly got two thousand photons sent back - a shockingly clear reply for a rover so old and distant. It's so strong that they can even send and receive signals during lunar daylight, previously thought to be impossible. Indeed, the strength of the return signal dwarfs those of the four other lunar reflectors already in use: those left by three Apollo missions and another on Lunokhod 2, a successor mission sent to the Moon in 1973. All five reflectors use corner mirror technology, which allows the reflectors to receive a laser signal and shoot it back on a parallel trajectory to the original pulse. This means it's possible to calculate the exact distance between the observatory telescope and the lunar reflector, with measurements possible to the nearest millimeter. Lunokhod 1 now joins its younger brother and the American reflectors in the last Apollo experiment still in operation, which aims to use these ultra-accurate measurements of the distance between the Earth and the Moon to chart the lunar orbit with total precision over the coming months and years. This isn't just a matter of cosmic bookkeeping - this particular Apollo experiment is testing whether Einstein's Theory of General Relativity really is borne out by empirical observation. The other four signals weren't strong enough for this experiment to move forward, but with the shockingly strong Lunokhod 1 as the new centerpiece of the operation, the great experiment can now at last begin. So far, the results show Einstein has nothing to worry about, but either way a once lost little Soviet probe is the key to demonstrating whether the theory of gravity really is everything it's cracked up to be.